I love pecan pie. It is so rich and indulgent I used to only make it once a year for Thanksgiving. 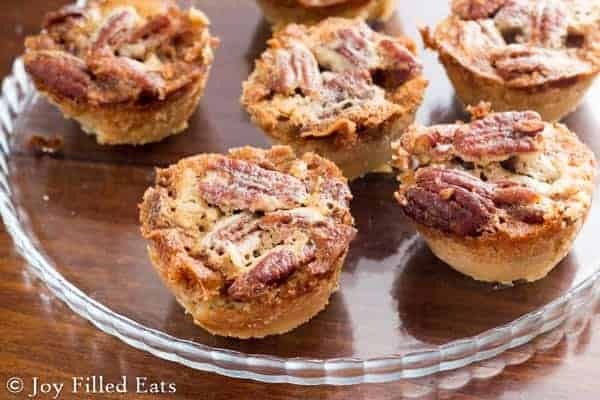 But now that I have a sugar free, low carb, keto recipe I plan on making keto pecan pie tarts much much more often. Pecans are my favorite nut. I also love pine nuts and cashews but pecans are number one. This is probably obvious due to the plethora of pecan recipes I already have: Pecan Praline Brownies, Toffee Pecan Turtles, Pecan Pralines, Caramel Pecan Sticky Buns, Pecan Cup Cookies, Gorilla Bread, and Candied Pecans. Pecans definitely win the nut contest. These were amazing with my Cinnamon Roll Ice Cream. We had the principal of my children’s school for dinner (love our small school so much) and I served these with that ice cream for dessert. This makes 8 individual pecan pie tarts. 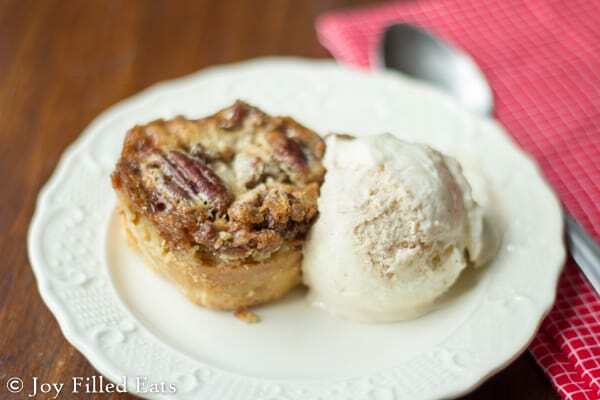 I haven’t tested it myself but I have had readers double this to make a full-sized keto pecan pie. That is on my to-do list for Thanksgiving this year. What are your favorite nuts? And your favorite nut recipe? I’d love to hear about them in the comments! Preheat oven to 350. 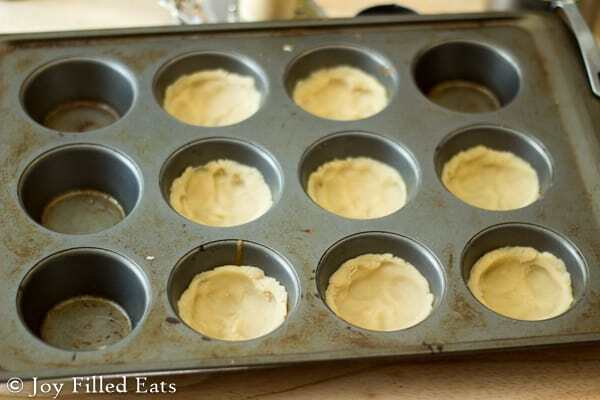 Grease 8 holes of a regular sized muffin tin very well with butter or shortening. Put the almond flour, coconut flour, and butter in a food processor and pulse until crumbs form. Add the water and pulse until it comes together in a dough. Divide into 8 pieces. 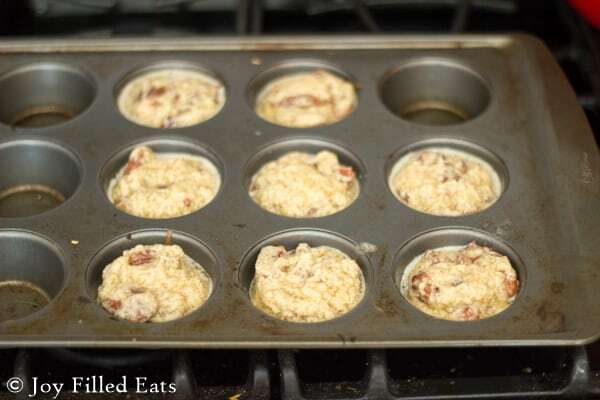 Press into the bottom and halfway up the sides of the prepared muffin tin cups. Prick the bottoms with a fork. Bake for 10 minutes. Meanwhile, in a medium bowl combine the 6 tbsp butter and sweetener. Beat with an electric mixer until smooth. Add the vanilla, molasses, heavy cream, and egg. Beat until combined. Stir in the pecans. Divide between the baked crust shells. Bake for 20 minutes until no longer jiggly and golden brown. Cool completely. Run a knife around the edges to loosen the cups and pop them up. I prefer to make these a couple days ahead of time. The flavor improves after being in the fridge for a bit. *** NOTES about Molasses. One teaspoon of molasses has 5 carbs. This recipe makes 8 tarts so each has about .6 carbs from the molasses. It is used for flavor, not sweetness, in this recipe. But you can just leave it out if you prefer. Has anyone tried making this into the pie yet? I saw a comment about having to double or triple the recipe. What is the final outcome? Hi, is the 7g total/4 net carbs per *each* mini tart? What is the serving size, please? Looks absolutely delish!! I made these for Thanksgiving and topped with my no churn vanilla ice cream recipe and my boyfriend declared this the best dessert ever while making animal noises devouring it😂 Thank you so much for a fantastic recipe. I used 100% erythritol so I upped it to 1 cup, and added some vanilla cream sweet drops as well. They're perfect. They did stick to the my very well greased pan but that may be from the amount of erythritol, but once scooped out and topped with ice cream that doesn't matter at all. Will be making these regularly! These are amazing! I forgot to bake the crust first and a few fell apart but still so good! And I didn’t have pecans so I used walnuts. I will try again soon! Hi what other sugar substitutes can I use that can be store bought? I want to make this for tomorrow so ordering online ain’t a option. Please let me know ! Thank you. I have not tested this with other sweeteners. If I was going to try I'd go with truvia. I have stevia would it be same 3/4 cup ? No. Stevia is much much sweeter. I do not know the conversion and I don't think pure stevia will work. Sorry! These are so delicious! How do you store these in the fridge so that they don't get tossed around and break? Also, do these hold up well after freezing? Hide them in the back? They do freeze well. Is this filling less gooey than a real pecan pie, they turned out beautiful and came out of the pan perfectly,thanks will use this again. I sm attempting to make this for Thanksgiving. The crust is powdwer, i followed the directions exactly. Any suggestions? You need to keep processing it in the food processor until it comes together into a dough. This takes 1-2 minutes of processing to come together. Are you sure you used the correct amount of coconut flour? That can make a big difference. I'm a sucker for mini individual dessert, these are perfect for a little snack or a little bite with ice cream after dinner. These tasted even better the day after. 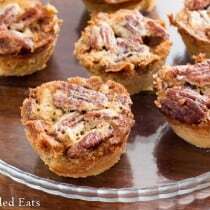 My husband loves pecan pie but I worry about the calories. The mini ones worked out perfectly for us. Hi Ann, you will need approximately twice as much. I have not tested this with just xylitol though. My sweetener is twice as sweet as xylitol. Is there a non-dairy option I can use instead of the heavy cream?? I think full fat coconut milk would work. I was just going to ask that, now I have all the ingredients! How many of these is one serving? One. They are the size of a cupcake. Yes, it should work in the crust. We always made mini tarts, have you tried this? Suggestions on cooking time? Thanks I really want pecan pie for Thanksgiving! I haven't made this into a full sized pie yet but I may be tomorrow! My guess is to add 10 minutes and then just check every 5. Not a pie, but mini muffin size is what I'm asking about. Ahh, sorry, if you make them smaller you can probably just cut the baking time in half. I'd start checking them every few minutes after that. This recipes looks wonderful. Thanks for sharing. Would walnuts work instead of pecans? Hello! I recently started eating low carb about 8 months ago after weight loss surgery and your blog has been an AMAZING resource for me! I have a question about this recipe (would like to make for thanksgiving). Can I use just straight stevia instead of that specific brand blend? Stevia is what I have and buying these ingredients can get expensive! Thanks for all you do! Yes, any plain stevia works. I follow Keto, so how can I substitute for the molasses? One teaspoon of molasses has 5 carbs. This recipe makes 8 tarts so each has about .6 carbs from the molasses. It is used for flavor, not sweetness, in this recipe. But you can just leave it out if you prefer. 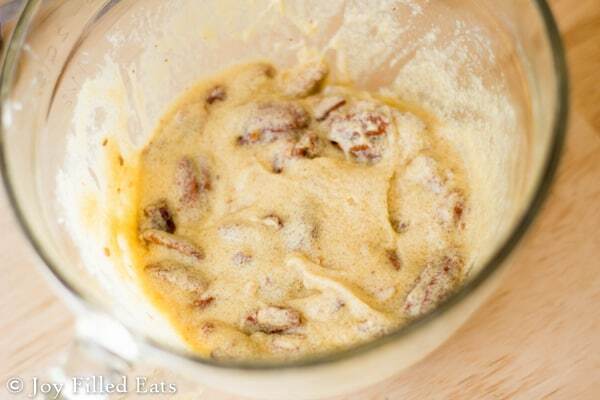 I'd like to make a pecan pie using your recipe. Could you tell me if you've tried it and how many times to multiply your recipe? TIA! I haven't made a full sized pie yet with this recipe. My guess would be to double it but you might need to triple it. New to THM and was wondering if this would be an S? Honey works fine but looking to try this today. I make tossed salad with everything in it and at serving top with sliced strawberries, toasted pecans and feta cheese crumbles. Yum. I'm hopping this sweetener won't be as hard as honey. Thanks! This recipe is ahhmazing! It's the first dessert that I have liked after starting thm 2 months ago (I almost wondered if I accidentally slipped in some sugar. ;)) ! Thank you! Can I substitute honey for the artificial sweetener? I used the same kind of sweetener and it crystallized in the middle. What did I do wrong?! Would suggest cooking the filling in a pot before hand to melt the sweetener? Sugar alcohols do tend to crystallize but I haven't noticed that in this recipe. Did you refrigerate them? Would THM baking blend work in place of the almond and coconut flout? It should. Use a little less. 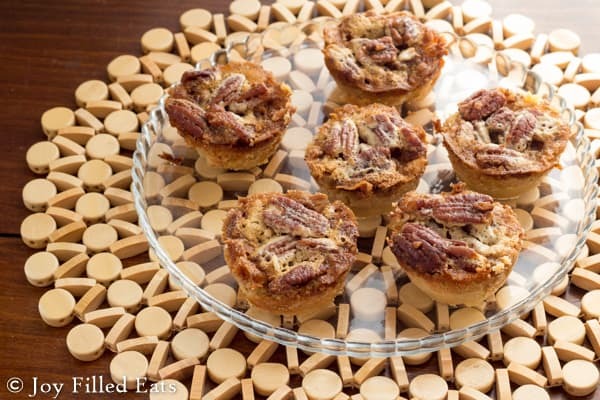 The taste is exactly like real pecan tarts. However getting them out of the muffin tray was impossible. It ended up being a delicious nightmare. Next time I will make the recipe in ramekins. 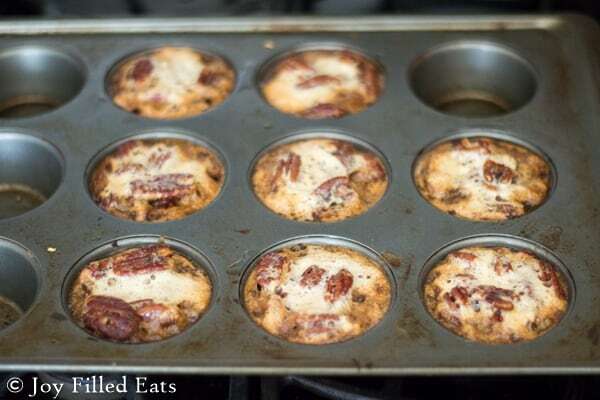 I have never had a problem getting them out of the muffin tin....I put them into the fridge for an hour and take them out..since it is SF sweeteners there is nothing to be sticky so they pop out! I don't even prebake the crust before filling. I just fill and bake for 20-22 minutes. Refrigeration is the key. I can't get mine out either...stuck solid! Made them for Thanksgiving for my guests and I am going to have to have them just scoop from the tin to the bowl (have been refrigerated for 5 hours, no difference). They are delicious though! I run a thin knife around the edge to pop them out. Truly Delicious!!! I'm always very skeptical knowing I will not LOVE or even like anything with a low carb crust! I typically am so disappointed I don't even eat it and end up throwing it away. NOT THIS TIME!!! I didn't even want to share!!! The only tweak I made was I added protein powder in place of coconut flour and I added a little sweetness to the crust... mostly out of fear I would already hate it!! Boy was I wrong! So good and crunchy like a crust should be!!! Mmmmmm Thank you!!! Have made these twice in the last week. Delish! As in OMG!!! The first time I didn't prebake the crusts and just baked the whole thing 20 min. Turned out perfectly...so the next time I did the same thing but tweaked the filling...omitted the cream, added 1 tablespoon jack Daniels whiskey to the goo and added 4 sf choc. Chips to the bottom of the tart. I then chopped my pecans but not a cup, more like 1/2 cup (less carbs.) Sprinkled that over the goo! I call them Derby pie tarts. Hi. What is your sweetener blend that you used, or can I use liquid or powdered Splenda? Thanks. Hi Lorraine, I use a blend of xylitol, erythritol, and stevia. http://joyfilledeats.com/sweetener I'm not sure if splenda would work in this recipe. If you do half and half. I did Pyure and Splenda, it worked well for me. What is the final carb count? Well they tasted delish, but the filling bubbled out into the pastry when cooking – this make them stick to the pans. Must definitely wait a day or two so they harden up in the fridge to remove from tins. . Also this pastry was really, really good – it's much better than the usual LC melted butter & almond flour pressed into the tins. It is almost like 'proper' shortcrust/biscuit pastry (I did add 1 teasp of natvia and a pinch of salt to the pastry).I am going to try it as a base for LC lemon curd tarts and I might add a pinch of xanthan gum. Thank you for sharing your recipes. would baking blend work in place of the coconut and almond flours? I only have it right now? I use the little plastic measuring cups that come with liquid medicine sometimes. That's actually what I used for this and then I converted 30 ml to 1 oz before I posted. I knew 30 ml would confuse everyone. lol. 1 OUNCE heavy cream? Really? Couldn't you just tell me how much this is in teaspoons, tablespoons, cups, etc. ?